The new Audi R10 made a brief appearance at the Los Angeles Auto Show yesterday (Jaunuary 3) – with Tom Kristensen and Head of Audi Motorsport Dr Wolfgang Ullrich also present. 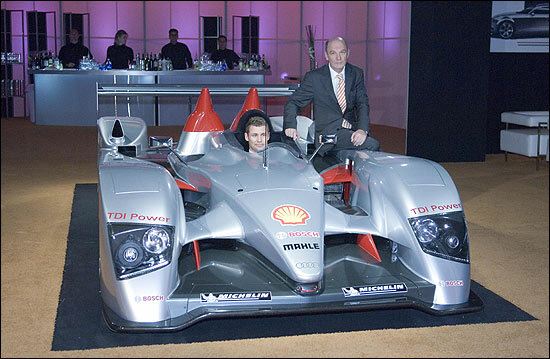 The diesel-powered prototype was displayed to 350 invited guests, ahead of the opening of the Show. The R10 was flown back to Germany immediately after the presentation, for more testing ahead of its debut at Sebring in March. Six drivers will drive the two cars entered at Sebring and Le Mans, but only Tom Kristensen has so far been confirmed to drive. Frank Biela and Emanuele Pirro are known to have driven the R10 already, as well as the Dane.